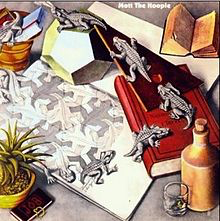 Mott The Hoople’s debut album, in 1969, three years before their Bowie-inspired renaissance, was a competent, but somewhat patchy affair. A great cover, by the way, but utterly irrelevant. Nicely remastered, it kicks off with a storming semi-instrumental cover of The Kinks’ “You Really Got Me”, that almost sounds like a studio jam, then the Dylanesque “At The Crossroads” (one of Ian Hunter’s perennial influences). A cover of Sonny Bono’s “Laugh At Me” is not bad at all, neither is the most obvious single, the upbeat, riffy “Rock n Roll Queen”. “Half Moon Bay” is a bit introspective and the quality dips a little on the old “side two”. "Backsliding Fearlessly" from the old "side one" is a good one though, but you can't help but get the impression that this album saw the band go into the studio, play, and say "ok that'll do" in a "just happy to be there", rough and ready sort of fashion. I don't think they really thought this album through. It has the feeling of a studio jam pervading the whole thing. Included here is another Dylan-inspired number, “Road To Birmingham”. It should have been on the original album, to be honest, as should “Little Christine”. I just feel there was more that could have been put on here, and it was something of a missed opportunity. Three more albums over the next three years would do a little to dispel that notion, but all the albums were ever so slightly flawed. Therein lay their appeal, however.